The CWT precision linear-cutting tool is, simply put – an exceptionally-engineered bladed guide rule that is designed to speed up and refine the process of manual cutting. It is incredibly easy to use and has standard blades that can be changed in an instant, This essential piece of equipment will save you time, increase productivity and reduce unnecessary media wastage and its accuracy and precision are outstanding. A coveted and extremely useful tool for large-format print specialists, sign makers, photographers and print shops. The CWT Linear cutter has a full-length anti-slip mesh fixed to its flat underside giving you superb grip without damaging the graphics, nylon guide wheels for nearly silent operation, adjustable constant-pressure cutting control and an adjustable knife depth. This unique non-skid feature, where the media is moved not the cutting tool, guarantees absolute precision and is tough enough to cut through a broad range of both soft and rigid media and materials. 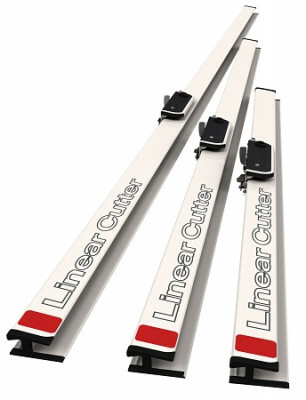 Ideally suited for use with the CWT application tables, our linear cutters can also be used on any suitable flat, protected surface and are supplied in a variety of lengths from 1.2 metres up to 5 metres with several options in-between. The readily available and easy to replace knife blades can be secured at the correct depth for any given application and can cut through a multitude of substrates from delicate fine-art papers and foam-centred rigid board to solid-centred plastic boards up to 5mm thick. Just note that thicker substrates may require a series of lighter cuts rather than one single, deep cut. All of our CWT linear cutters are completely maintenance free and print-production professionals consider them to be one of the ‘best tools in the box’! The idea behind this tool comes from decades of our own experience in traditional sign manufacturing where we perform long and precise cuts every day. We also wanted a tool so easy and flexible to use that anyone can handle it in just a few minutes and be able to change the standard and affordable blades in a matter of seconds. With this tool you will experience a huge increase in your daily production and also have the satisfaction of getting perfect results every time while avoiding unnecessary waste of material.